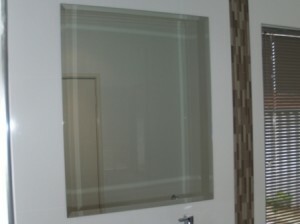 Glass100 is Perth’s leading supplier of custom made domestic and commercial mirrors. High Lustre Mirrors for clarity of reflected images. Mirror edge sealant applied to all mirror edges to maximise mirror longevity. All fittings and fixtures are compliant with the rigorous Australian Standard AS 1288. Our mirror products not only look great, but are fit for purpose. Glass100’s commitment to quality ensures that your glass installation not only looks great and is functional when it is first installed, but remains so for years to come. Frame Colours – Framed Mirrors. In addition to the standard slimline aluminium frame colours of Bright Anodised (Bright Silver), White Powdercoat and Matt Annodised (Matt Silver), Reflections Series Custom Made Mirrors have a further 13 optional frame colours available to provide a match to your décor. For bathroom installations, these colours are the same as shower screen framing colour options. Polished and Bevelled Edges – Frameless Mirrors. Reflections Series Custom Made Frameless Mirrors are available with both polished or bevelled edging. Machine polished edges provide a safe, timeless and minimalist perimeter. Bevelled edging provides a distinct sloping perimeter than is available in widths ranging from 15 to 35mm. The custom made nature of Reflections Series Domestic Use Mirrors makes Reflections Series Domestic Use Mirrors exceptionally versatile, being suitable for a range of applications including bathroom mirrors, feature wall mirrors and mirror robe doors. Additionally, Reflections Series Domestic Use Mirrors can be manufactured with a range of edge finishes including framed, frameless, bevelled or polished to suit the individual requirement. Click here for more information on Reflections Series Domestic Use Mirrors. Reflections Series Custom Made Salon, Studio & Gym Mirrors provide professional solutions for installations requiring large size mirrors. With a unique installation method combining horizontal slimline framing with high lustre safety mirror the resultant image is clear, proportionate and crisp. Click here for more information on Reflections Series Salon, Studio & Gym Commercial Mirrors. Reflections Series Mirrors includes a range of round Security Convex Mirrors that are suitable for both internal and external installation. Diameters available include 330mm, 457mm, 660mm & 914mm. We manufacture and install custom made Sliding Mirror Wardrobe Doors utilising award winning components to provide fit for purpose, low maintenance concealment of bedroom wardrobe recesses, linen cupboards, laundry cupboards and storage shelving. Our mirrors are manufactured with longevity in mind. The application of a specialist mirror edge sealant protects the reflective mirror silvering against delamination. Glass100 also makes sure our mirrors comlpy with the strict requirements of Australian Standard AS1288. Need a new shower screen to compliment your new mirror? Click here to see our range of shower screens.